Congratulations! Winners have 24 hours to get back to me. Or else I will have to pick another winner. Yet another giveaway time: The birthday celebration continues! This time the giveaway is sponsored by the “Beanilla“. 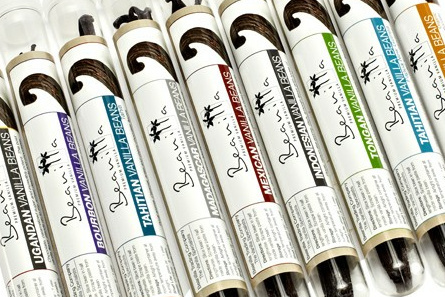 They are giving away their most famous “Premium Mexican Vanilla beans”. Excited? Want to know more? I will get back to the details in a while but at first let’s talk about what I made using their rich mexican vanilla beans. So what did I make using these beans this time? 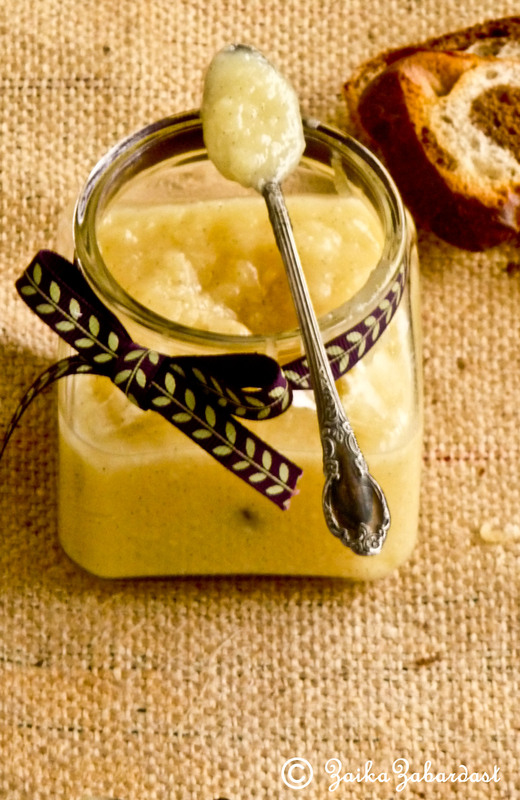 Vegan Pineapple curd! 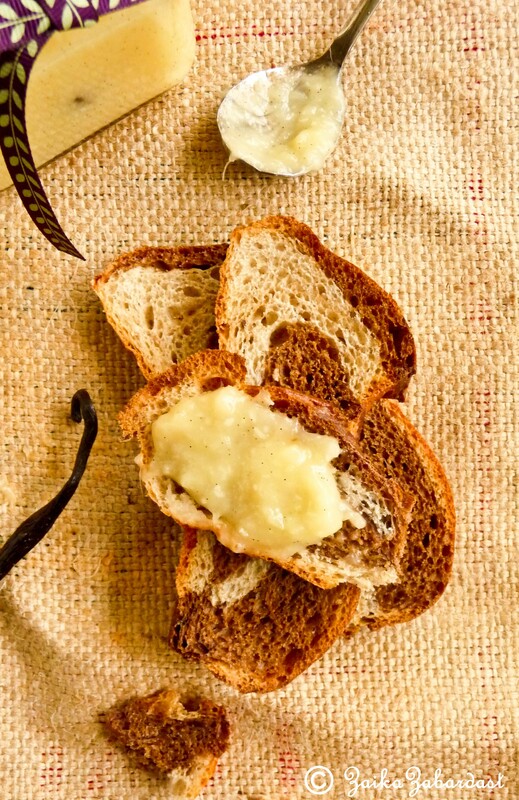 Smooth, sweet and tangy – just perfect! And it is absolutely out of this world. If you are familiar with fruit curds then you know what I am talking about but if you are not, then let me explain. What is this fruit curd? 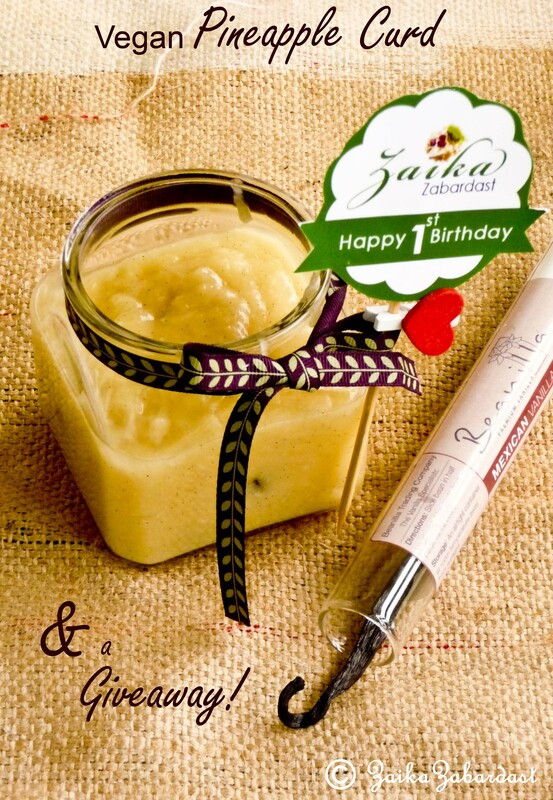 Basically it is kind of thick, smooth and flavorful sauce made of fruits, eggs and citrus. And as per Wikipedia, it was originated in England back in 19th century. It is normally used over scones, biscuits, muffins, cupcakes, pies etc… Well whatever it is, it is simply delicious. You just can’t stop eating it. Pineapple and coconut is such match made in heaven, isn’t it? Plus it is sooo summery and kids love it. Since I do not eat eggs, this recipe is vegan – that means absolutely no unnecessary fat and calories from eggs and butter. I even substituted sugar with Organic Agave nectar to sweeten this curd. So this recipe is healthy, low in fat and low in sugar J Although it is vegan, I promise about not compromising on the taste, you know why? Late in March, I participated in this charity event called Cupcake Palooza. Where I made about 180 mini pina-colada cupcakes filled with this delicious chilled pineapple curd and it was a hit. People came for seconds. What else do I need, right? So as I said this is a full proof recipe which you will surely enjoy! Oh and BTW, I still wonder why it is called CURD? Technically curd and yogurt is the same thing…so still trying to figure out the reason behind this name! Do you know why? Please explain. Drain canned pineapple and save the juice. 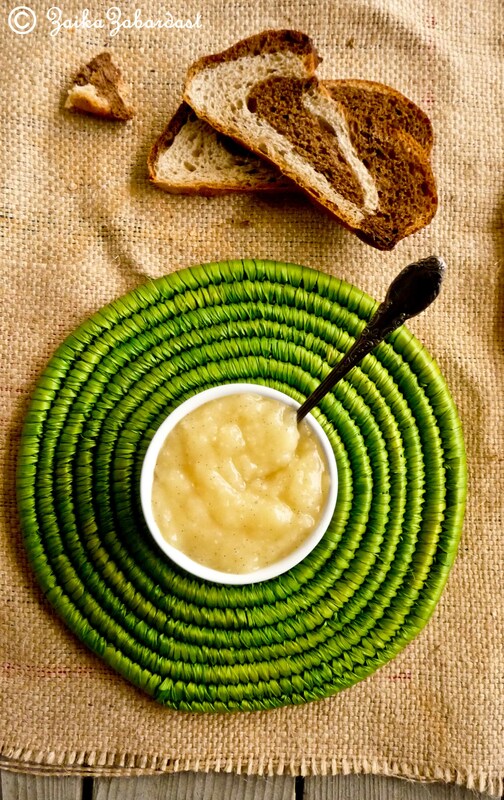 Puree pineapple using a food processor, and use 1 ½ cups of it. 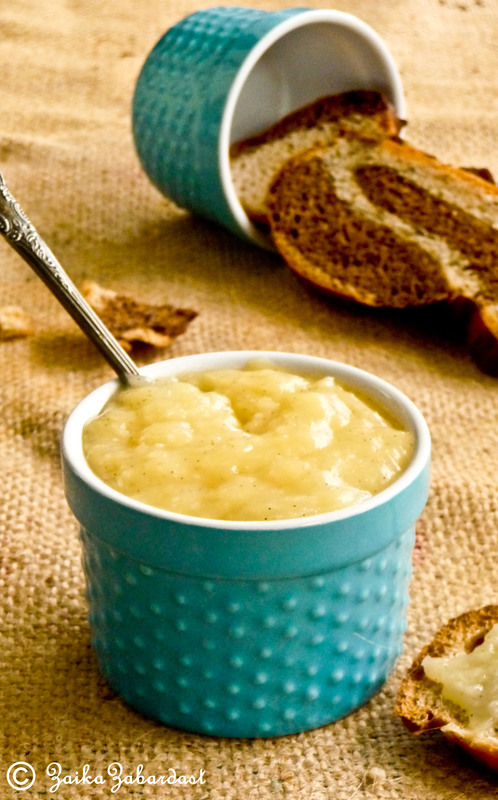 Mix pineapple purée with coconut milk, agave nectar and dissolved corn starch. Whisk well. Slit the vanilla bean to half using knife and add this to the pineapple mixture. Let the pod release the beans itself while cooking. In a medium saucepan, cook this mixture over medium heat. Stir continuously. Cook until the mixture begins to thicken and you see bubbles appearing on the surface. It takes about 10 minutes. Keep stirring. Right at the end, add margarine, mix well and cook for 3 more minutes. Remove it from the heat and transfer the mixture to a glass bowl. Tips: If you are going to chill it in refrigerator, then cover the surface of the curd with plastic wrap to prevent dry layer. You can take out the bean pod once the curd is cooked and chilled. Choice is yours. 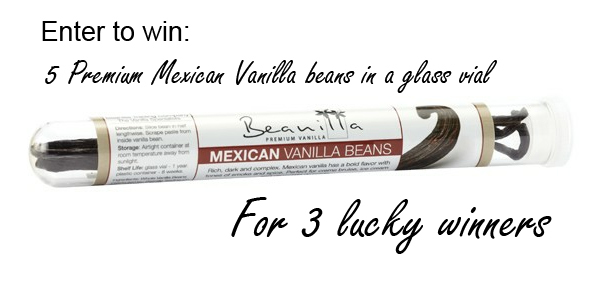 Beanilla beans is generous enough to giveaway 3 glass vials filled with 5 premium Mexican vanilla beans for 3 lucky Winners. Wohoo! What a wonderful giveaway! This giveaway is open for USA residents only. If you live outside the USA, and if you still wish to enter, you have to provide USA address where they can ship the price pack. This giveaway is open until Thursday (06/07/12) 11:59 pm (your time). I will pick three lucky winners on Friday (06/08/12). I will use the random number generator software to pick the winners. So if you choose to go for extra entries, make sure to leave separate comments for each entry. Otherwise the number generator software will not recognize your entry. Mandatory entry: Just leave a comment in this post saying what will you make with this vanilla beans if you win. Tweet about this giveaway saying: “I just entered to win beautiful premium Beanilla from ZaikaZabardast http://wp.me/pTI6E-ty @zaikazabardast @beanilla” or something like that. ← Happy Memorial day and few last moment recipe ideas for your weekend party! Congratulations Becca for winng this giveaway, You have 24 hours to claim your prize. Becca, Unfortunately I have to pick another winner to replace you because you haven’t claimed your prize in last 24 hours. Sorry. Congratulations Dixya for winng this giveaway, You have 24 hours to claim your prize. 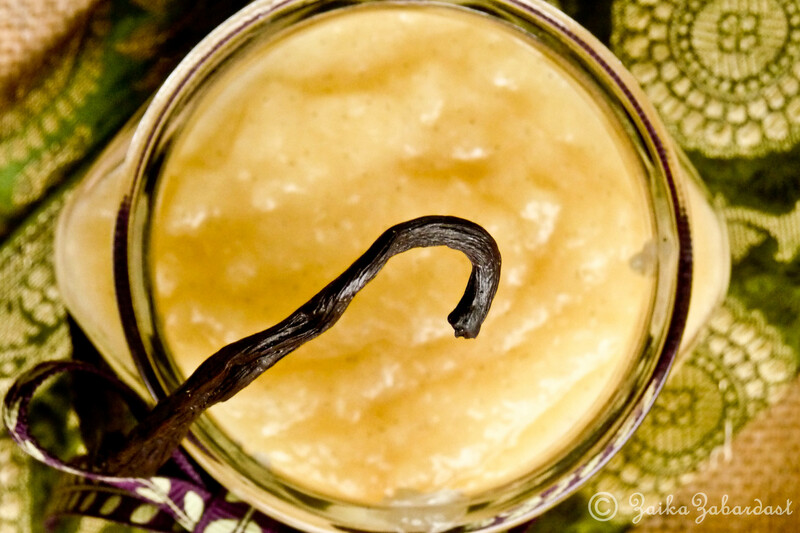 Once you use real vanilla beans, you’ll never look back! I’d use them to make some of my “famous” apricot vanilla bean jam! Grishma, lovely curd you have made. 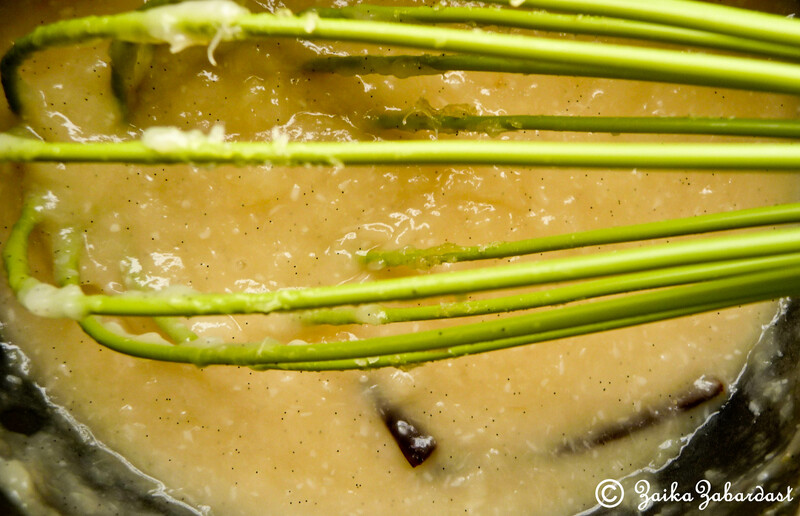 Vanilla beans are just the best. I have often used the beans in baking and there is nothing like them to add an over the top flavor to a cake. Well done. Thank u very much Teresa. Congratulations Teresa for winng this giveaway, You have 24 hours to claim your prize. I think fig vanilla preserves sounds interesting. I’m dying to pick the first figs off our new tree! would love to recreate a cake we had in Slovenia — Lake Bled Cream Cake (a vanilla-custard-and-cream cake…goggle it!)!!! i know they used top quality vanilla, and we’ve been waiting to get hold of some to use in this recipe!! will transport us back to that lovely country! Like Beanilla on FB that’s how I found your great site! Firstly, happy yeariversary! I’m sure it’s an exciting time for you! Secondly, I have some homemade vanilla extract hanging out on top of my fridge. I’ve used it several times, and despite buying wild turkey, or old crow or whatever the bottomest-shelf whiskey available was, it still adds wonderful flavor to my baked goods. With these beans I’d love to make some vanilla cupcakes with a delicate icing to let the vanilla flavor shine! If I win, I’ll make vanilla ice cream. I follow Beanilla on Facebook. Homemade vanilla bean ice cream! Thanks for this chance to win some awesome beans! Vanilla bean ice cream. Never made it, if you can believe it! I followed you on Pinterest. Yummy stuff! I follow you on your facebook page! I already follow you on Beanilla! Congratulations Gloria for winng this giveaway, You have 24 hours to claim your prize. Gloria, Unfortunately I have to pick another winner to replace you because you haven’t claimed your prize in last 72 hours. Sorry. I would love to make some creme brulee topped with some fresh fruit with those vanilla beans. And definitely some REALLY good vanilla ice cream, too! I follow you on Interest. Lynne, Unfortunately I have to pick another winner to replace you because you haven’t claimed your prize in last 72 hours. Sorry. Grishma, I’m SO bummed because I have a copy of the e-mail I sent back to you on the 8th after you e-mailed me. I was wondering why I hadn’t received anything. Oh well, will try again next time. Lynne, I did check my email many times including my spam folder before I chose another winner. But I did not find your reply. And that is why I had to chose another winner, Sorry! Did you send it to zaikazabardast@gmail.com ?? I am also now subscribed to your newsletter!!!! I follow Beanilla on Twitter. I also follow Beanilla on FB. Id make vanilla bean ice cream! Joanna, Unfortunately I have to pick another winner to replace you because you haven’t claimed your prize in last 72 hours. Sorry. I have a fantastic banana baked oatmeal recipe that would be AWESOME enhanced with real vanilla bean! Congratulations Corgipants for winning this giveaway! You have 24 hours to claim your prize. Corgipants, Unfortunately I have to pick another winner to replace you because you haven’t claimed your prize in last 24 hours. Sorry. I would use the vanilla bean to bake some cookies. 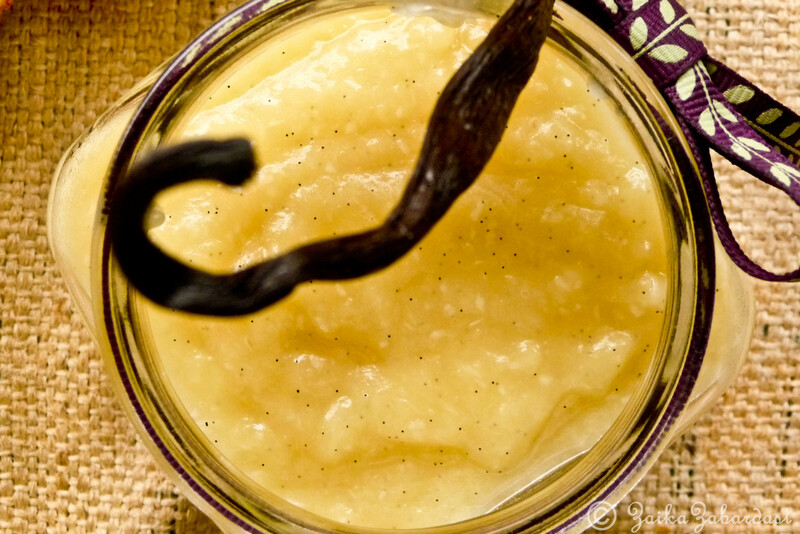 Pineapple curd sounds like a delicious treat for summer and a great use for the vanilla!